Each year, the Alumni Association reports to the community on its activities and accomplishments over the past year via an annual report and an Annual General Meeting. For more information about our AGM, please call 604.822.3313 or e-mail alumni.association@ubc.ca. 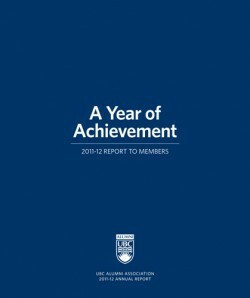 For annual reports from previous years, please visit http://www.alumni.ubc.ca/about/annual-report/.